Words of Wellbeing, Self-Care for ADD. In 1780, Professor Meinard Simon Du Pui suggested that from a medical point of view, man was Homo Duplex – that is, he possesses a ‘double brain’. Nearly a century later, in the late 1800s, London physician Arthur Ladbroke Wigan was viewing the autopsy of one of his patients and when the skull was cut open he found one of the patient’s cerebral hemispheres was missing. Wigan was surprised because he knew the man could read, write and function normally. Wigan therefore concluded that if one cerebral hemisphere was capable of supporting a fully functioning mind and personality, it followed that normal humans with two intact hemispheres must have two minds. In the 1960s, Neurobiologist Dr. Roger Sperry performed a series of “split-brain experiments” that cleared the way for a better understanding of the duality of our minds. Normally, both cerebral hemispheres of the brain are joined by millions of nerve fibres called the corpus callosum. Sperry cut the fibres of the corpus callosum of people experiencing severe epileptic seizures. The studies revealed that when surgically separated, the two hemispheres function as two independent brains with unique personalities and specialise in different tasks. His work indefining the functional specialisation of the cerebral hemispheres earned him and his colleagues the Nobel Prize for Physiology or Medicine in 1981. 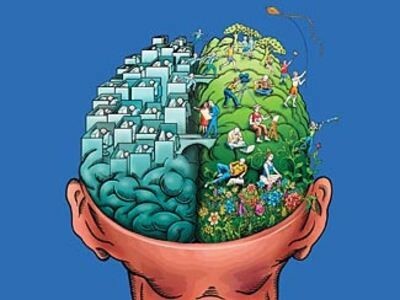 The right hemisphere controls the left side of the body and is the creative side. It is involved with images, emotions, music, imagination, spatial awareness, intuition, spontaneity, movement, visual memory and holism (the big picture). The left hemisphere controls the right side of the body and is the logic and reasoning side. It is involved with language (reading, writing, speaking), analysis, auditory memory, linear time, sequencing, and details. Using functional imaging (fMRI), scientists are now capable of visualising which specific neurons are engaged in performing a designated function. They have found that because the hemispheres are so neuronally integrated via the corpus callosum, practically every cognitive behaviour we exhibit involves activity of both hemispheres – each hemisphere simplyprocesses information differently, all the while complementing each other. It is nearly impossible to distinguish what is going on in the right versus the left hemisphere because our two hemispheres are so adept at weaving together a seamless perception of the world. So rather than having two distinct brains, we really have two complementary halves of a whole brain. It makes sense that we were designed to simultaneously use the functionality of both hemispheres and that doing so would enhance the overall processing capacity and performance of our brain. For example, when confronted with a problem, the right brain’s creativity is essential to generating ideas and options and the left brain’s logic is crucial to analysing their feasibility and implementing the solution. So why does it seem that Western society tends to favour the left-brain? Logic, reason, academic learning and‘rational thinking’ seem to be more highly valued. Roger Sperry himself said that modern society “discriminates against the right hemisphere.” But as we have just seen, our brains were designed to reach their optimum capacity when both hemispheres work seamlessly together. So, is it right to rely so heavily on the left brain? The story of Harvard-trained Brain Scientist Jill Bolte-Taylor offers an interesting view of what we might be missing out on by living our lives in left-brain dominance. She proposes that feelings of wellbeing, optimism, joy and deep inner peace are available to us if we learn to “step to the right” of our left brains. In 1996 Taylor was responsible for teaching students about the human brain at Harvard Medical School. One morning she experienced a rare form of stroke in the left hemisphere of her brain. Within four hours a major haemorrhage had completely deteriorated her left brain’s ability to process information – she could no longer walk, talk, read, write or recall any of her life. Taylor’s book My Stroke of Insight documents her journey in both suffering from the stroke and recovering from it. She recounts the step-by-step deterioration of her cognitive abilities in extraordinary detail, using the benefit of her knowledge as a neuroanatomist. Yet Taylor claims that she “learned as much about my brain and how it functions during that stroke, as I had in all my years of academia.”What she experienced as her left hemisphere functions deserted her is nothing less than fascinating, so what did she find? It took Taylor roughly eight years to reconstruct her left brain abilities – she had to learn to read, write, talk and walk again. While she was doing this she was able to observe things that modern neuroscientists where missing in their primarily neurological perspective of the functionalhemispheric asymmetries. Taylor became interested in the psychological or personality differences contained within the two hemispheres and was able to note what happened when her left mind was no longer able to dominate her personality as it had done prior to her stroke. - Celebrates its freedom in the universe and is not bogged down by the past or fearful of thefuture. - Is open to new possibilities, willing to try new things and thinks out of the box. - Is all about the richness of the present moment. - Is filled with gratitude, it is content, compassionate, nurturing, and eternally optimistic. There is no judgement of good/bad or right/wrong, so everything exists in a continuum of relativity. - Takes things as they are, acknowledges what is present and pays no attention to territories or artificial boundaries like race or religion. - Allows the freedom to explore the world with childlike curiosity. - Is adventurous, celebrative of abundance and socially adept. - Is sensitive to non-verbal communication, empathic, and accurately decodes emotion. - Is open to the eternal flow, existing at one with the universe. - Is the seat of the ‘divine mind’, it is the knower, the wise man/woman, and the observer. It’s quite a list! Taylor’s experience of losing her left mind has led her to believe that the feeling of deep inner peace is simply neurological circuitry – which is located in the right brain. This circuitry is constantly running and always available for us to hook into. In other words, peace is something that can only happen in the present moment and only the right mind is capable of experiencing the present moment. Sounds like the right brain could be quite useful – I don’t know anyone who isn’t in need of some peace!